“Now [Jobs, Skills, Training and Labour Minister Lori Sigurdson] said to me, this is the reason why we’re [raising the minimum wage]: because we want every Albertan to be able to have, to go home and have a decent living wage. Hate to tell the Wildrose jobs critic, but he might want to go get educated on history. Despite his claim that “no one started this minimum wage as a living wage,” minimum wage laws have, in fact, always had a thing or two to do with earning enough money to live on. Of course, back in the good old days, the captains of industry opposed minimum wage laws. Oh, they predicted “moral degeneration” and “laziness” and and yes, even “stifled ambition,” but something wandered along and changed the minds of business leaders – yep, you guessed it: Communism! And hey, just throwing this out there: Alberta has the highest rates of inequality in Canada. It’s even worse than it is in the U.S. 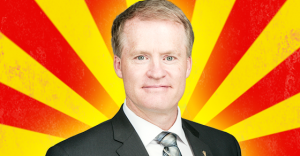 So if Hunter is as worried about the red menace as his comments at the Wildrose AGM suggest, maybe he should just support raising the minimum wage? Photo: Wildrose Party of Alberta. 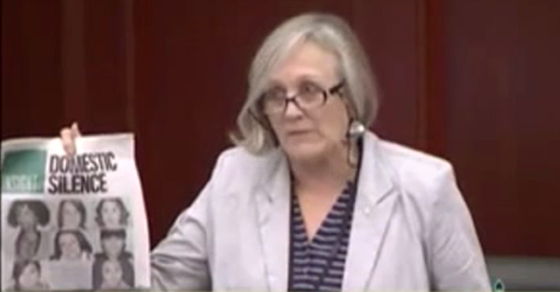 NDP MLA Maria Fitzpatrick rose in the Alberta legislature Monday and gave a powerful explanation for why she’s supporting a bill that would make it easier for women to escape abusive homes: her own experience.